Global Investment Research Challenge is an international competition, held by the CFA institute yearly in searching for the best sell-side equity analyst in the world. In total 1600 participants from 400 universities all over the globe participate this year. As a result, CFA GIRC has three rounds: local, regional and global. Hence, the winner of local level will be the country representative and then advance to the regional competition where the best four teams from four regions, Asia-Pacific, America, New York and EMEA, will be competing in the global stage. Fortunately, this year is the first year that CFA Society of Thailand held �CFA Thailand Investment Research Challenge 2010� in order to select astute researchers at university level to represent Thailand to the Asia Pacific Challenge. 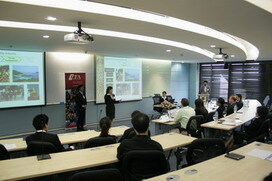 In total eight teams, including both undergraduate and graduate students, from five universities competed for the chance to represent Thailand, having �The Erawan Group� as the subject company. One month after the company visit, four teams were selected as the finalist due to superior score based on the research report. Finalists were given the opportunity to give a ten minutes presentation to the panel judges about the subject company and the recommendation, whether to buy or sell the stock, and after the presentation there was another ten minutes Q&A. 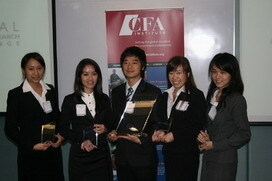 After the Judges deliberation, Thammasat Team was announced as the winner of �CFA Thailand Investment Research Challenge 2010�. As a result Thammasat Team, including Mr. Patcharachai Puttikulsathi, Miss Athivadee Panuvatvanich, Miss Lalita Chaimonthonon, Miss Nutnicha Sankosik and Miss Sunapa Sangnapaboworn, will represent Thailand to compete in the regional stage on March 6, 2010. With all hope and responsibility, all of us realize of our duty and will do our best to represent both BBA program and Thailand. Lastly, we would like to express our sincere gratitude to the CFA Society of Thailand for arrange such activity as a pilot project for the first time, all of us hope that this competition will become even more successful in the years after. Secondly, we would like to express our appreciation to our team advisor, Assoc. Prof. Dr. Pantisa Navabutr, Associate Director of BBA International Program for being such a great advisor and give us many crucial guidelines all along the competition. Moreover, another important supporter behind our success is K. Thaninee Satirareungchai, CFA, our mentor, who scarified both her work-time and leisure time to guide us throughout the competition and provide us valuable industry inside. The last but the least is all of our BBA professors who had taught us, your contribution in the past reflect upon our success today. We are truly thankful for all the support from everyone since the beginning of this competition until end. Posted date: February 9, 2010 � 15:30 hrs.